I'm not the biggest meat lover anymore, I find you can make much more tasty veggie dishes that don't need to centre around a serving of meat BUT, that said, you can't beat a chicken dinner. With it now being spring time and the weather slightly warmer, I felt like a gravy roast dinner wasn't exactly warranted so decided on this one pan spring chicken, inspired by that of The Londoner. There's something really inviting about a roast chicken that's left in the oven to cook in its own juices and the effect the slow cooking has on the vegetables in the pan. YUM YUM! I served mine with a handful of new potatoes that I halved, boiled for 5 minutes and oven roasted for around 35-40 minutes in a generous drizzle of olive oil, sea salt, black pepper and chilli flakes. First things first, preheat your oven to 180 (fan assisted) and begin the rub for the chicken. 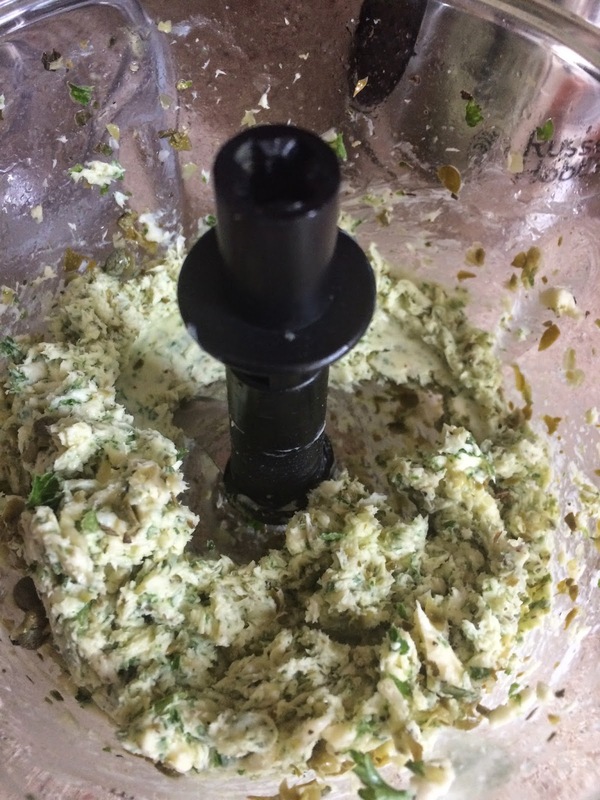 Using a mini blender (pastel and mortar is also fine) - combine your butter, parsley, Italian herbs, capers, garlic and apple cider vinegar. Add some black pepper to season. It needs to resemble a paste rather than being too lumpy. Spread it onto your chicken - covering as much as possible. This mush has a tendency to glue itself to your hands! Once your chicken is covered, pop it in the oven, uncovered, for 45 minutes. When the buzzer goes after 45 minutes, throw in your chopped baby carrots and put back in the oven for another 45 minutes. 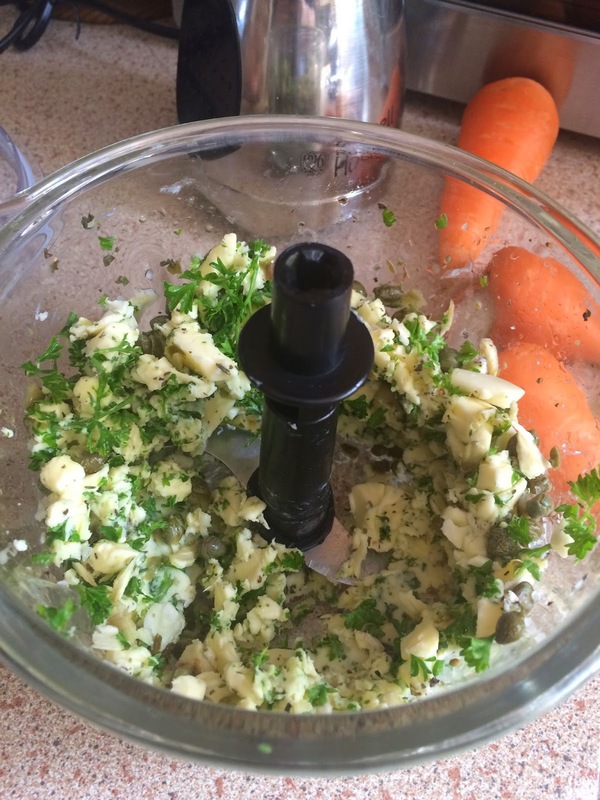 In the meantime, cut up your potatoes and boil for 5-10 minutes on the hob - if serving with roast potatoes. Put them in the oven when your chicken has 20 minutes left on the timer of the second 45 minute roasting. After the second 45 minutes, throw the asparagus in and cook for another 20 minutes. The dijon sauce takes about 5-10 minutes to make - add your stock cube to 1/2 pint of boiling water and heat in a small saucepan. Add your creme fraiche, dijon mustard and a sprinkle of black pepper and allow to simmer on a low heat. When it's warmed through, pour into a serving jug. When the timer goes off, dish everything up and drizzle the dijon dressing over to your hearts content. If I was serving this at home for myself rather than for my parents, I wouldn't serve with potatoes. I'd roast the chicken (from the second 45 minutes) on a bed of kale OR, for the last 20 minutes, on a bed of spinach. The dijon dressing goes really well with this though, I must admit!